Operating system: Red Hat Enterprise Linux 6.6 or 7.1 (x86 or64 architecture). Database server: Oracle Database 12c Release 1 (12.1.0.2.0) Enterprise Edition. Windows™ desktop: Windows 7 SP1 64-bit. Browser: Microsoft™ Internet Explorer 10 or 11. Web application server. One of the following: WebSphere® Application Server V8.5.5.5 (recommended), WebSphere Application Server Liberty Profile V8.5.5.5 (included). Messaging middleware (optional) with one of the following: WebSphere MQ V7.1.0.1 or Glassfish MQ V4.5.2. Document content management (optional) with one of the following: IBM Filenet P8 V5.2.0 or EMC Documentum 7.1 (requires 64-bit Oracle client and 32-bit Oracle client library files). 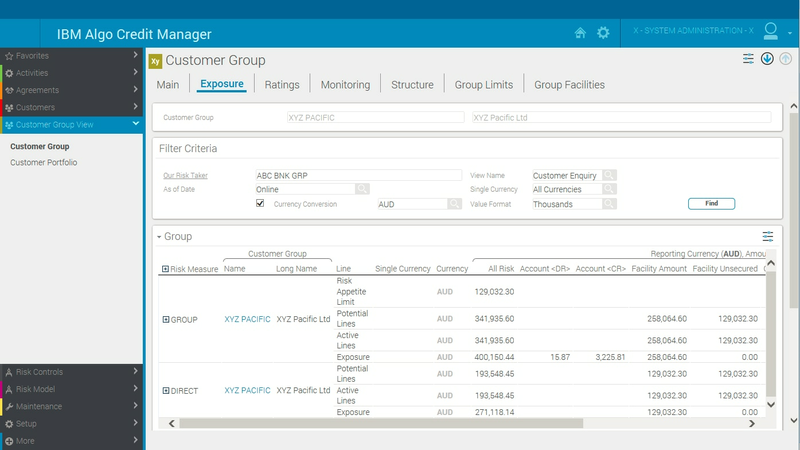 Dashboard Manager support (optional): IBM Cognos® Business Intelligence V10.2.2.1. Foundation Reporting Libraries support (optional): IBM Cognos Business Intelligence V10.2.2.1. These requirements are for a typical medium size implementation of 500,000 counterparties. Application server: Intel Xeon™ Processor E5 family or its equivalent: 16 cores, 256 GB RAM, 410 GB disk space. Database server: Intel Xeon Processor E5 family or its equivalent, 8 cores, 32 GB RAM, 300 GB disk space. The hardware required for the application depends on the amount of input data, risk model configuration, and overall system usage. A service engagement is recommended to determine the requirements for your system. Contact your IBM representative.